Have you bought a full licence? If you are using the free version, you must use a screen capture program like snippings (free with windows) or jing (free from techsmith) etc. The free version will let you create customer presentations (with screen capture) and calculate prices using a catalogue. With Premium support you can post your project file on this forum and we’ll send you back the production documents. So you get everything to work with but less stream lined that if you own a full version. This is why I’d suggest a quick TeamViewer session so I can show you how to use fully the free version. Yes I’m still in Demo Mode. This is the user code that I have attached below. Is there a different user code, or can you send me a link for the Pro Version? I’ve got clients waiting for plans…. I’m guessing that you are using the free version so the print and all other output is greyed out. In this case you need to do a screen capture, so I’d suggest we do a quick Team Viewer session to show you how to do this and also show you how to get prices and put together a client’s presentation document. Tell me if this interests you and we can set up an appointment for next week. You can customize out put in file>Print Setup. 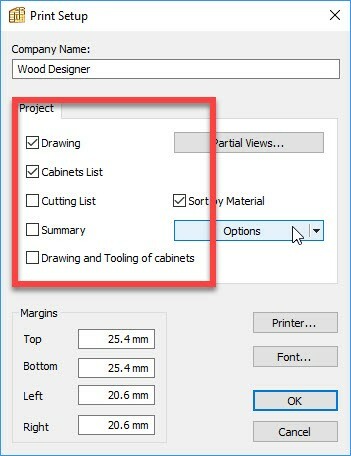 Just tick the options you need to out put and click File>Print. If you use the Print command when the 3D window is active you can output just the 3D. If you print to a PDF printer you’ll have a pdf file you can send via email. A simple client approval documents could be made of a 3D view and a technical documents with the general sizes. I attach a quick and simple example output for client approval. Is there any way to send my clients drawings as I work on designs before submitting them for cut lists or DXF files? I usually go through a few options and changes before needing to process.